Cleans the carburetor parts (chokes, float chambers, jets, and channels), thus, restoring their initial performances. Restores mobility of injector chokers. Removes contaminations from the air introduction manifold and fuel system. Increases engine power and acceleration. 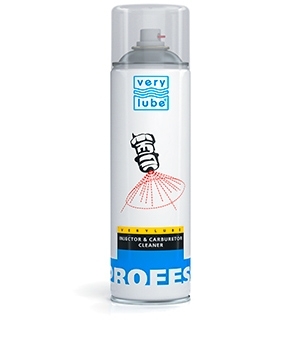 Reduces the content of harmful exhausts into the atmosphere. 1. Take off the air filter. 4. Spray liberally onto all visible carburetor parts. While cleaning, keep up increased engine rpm with a choker lever. 2. Spray the CLEANER onto the choker (into the air inlet) while the engine is warm and not working. 3. Start the engine, keep up the increased engine rpm with a choker lever for 3–5 minutes. For complex cleaning (fuel tank, pipelines, jets, inlet valves, sparkplugs, and combustion chambers). Before fueling, spray the CLEANER into the filler neck of a fuel tank (for 10–15 seconds for 20 liters of fuel).